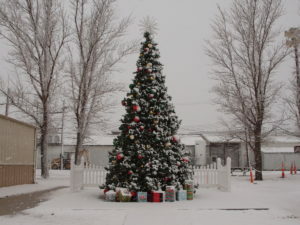 Weather did not deter the more than 250 people from multiple communities who attended the lighting ceremony and all-community Christmas events in Cawker City. A grant from the Hansen Foundation helped with the purchase of the commercial tree, which can be used for many years. In addition to the lighting ceremony and related events they launched the first All-Community Angel Program. A total of 38 children between Glen Elder, Cawker City and Downs were sponsored by generous community volunteers.